Ugg for Men is launching an integrated campaign for the holidays featuring quarterback Tom Brady. Premiering Nov. 19, the effort -- entitled "Pink Slip" -- will include TV, print, digital display and online videos, out-of-home, mobile, social and PR. The concept for the campaign originated from real life, inspired by one of Tom Brady's personal anecdotes. Even before he decided to partner with Ugg Australia, Brady gave his team members the Ugg for Men "Ascot" slipper, as a way to say thanks. Produced by M&C Saatchi Los Angeles and directed by the Guard Brothers, "Pink Slip" focuses on a dramatic moment when a football rookie is at a crossroads in training camp and walks up to his locker, consumed by anticipation over whether he makes the team or not. 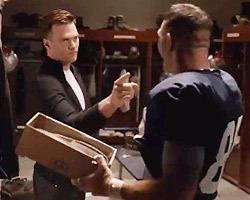 When he finds a pair of Ascot slippers in his locker and Brady shows up to congratulate him, the rookie finally knows the answer. Brady’s performance and lines were entirely unscripted, as the scene derives from an authentic moment. "The concept behind the 'Pink Slip' comes from an authentic tradition that Tom had even before working with Ugg," says Connie Rishwain, president, Ugg Australia, in a release. "What better way to highlight this moment through the holidays, tying it into the themes of teamwork and thanksgiving." The spot premiered on ESPN, ESPN2 and NFL Network. On the day of launch, consumers received a dedicated email directing them to view the commercial and behind-the-scenes video on the Ugg Australia Web site and other social media platforms. The digital portion of the campaign will run on CBS.com, Complex.com, Hulu.com, NFL.com, Pandora.com and YouTube.com. Print will include Details and GQ magazines. OOH will run in New York on bus shelters, as well as billboards in Los Angeles. The media was planned and purchased by KSL Media Los Angeles, and PR was overseen by M&C Saatchi PR New York. Brady was also featured in the spring 2012 and fall 2011 campaigns for Ugg. 2 comments about "Ugg Brings Back Brady For Holidays". Ryan Loechner from Mediapost, November 20, 2012 at 10:11 a.m.
Hey Brady, I never got my Uggs - does that mean I am off the team? Varun Gupta from NYU, October 19, 2015 at 5:20 p.m. I reckon Ugg is just trying to target the male consumer. Personally, I don't know why men would wear Uggs. They look like children's snow boots!